The University of California is using its power and position as a top tier university to take the lead in combating climate change. In the face of enormous challenges, we at UCLA are using this advantage to reach carbon neutrality by 2025. To be a part of this movement, let’s find out what we are doing today, what we need to do tomorrow, and how your talents and education can help make it happen. Carbon neutrality means taking in as much CO2 as we put out in the atmosphere. We take carbon in through reforestation and habitat conservation, while we emit carbon primarily by burning natural gas, coal, and oil for energy. The effects of climate change show on the face of a mother who cannot provide food for her children, on the hands of a bankrupt breadbasket farmer, and in the eyes of a family whose home has been swallowed by rising seas. It is everyone’s problem and everyone’s challenge. UCLA is taking that challenge. 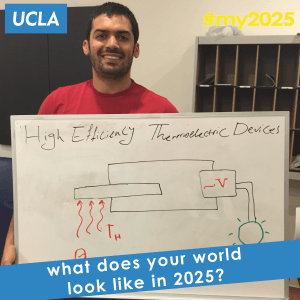 UCLA, along with the entire UC system, aims to reach carbon neutrality by 2025. By achieving this carbon neutrality we will halt our contribution to climate change and create a campus community of sustainability leadership. What does your world look like in 2025?